Manchester’s SKV Communications has been retained by MediaCityUK’s tech and digital enterprise hub The Landing for a third successive year. SKV’s appointment follows a competitive tendering and pitch process which was overseen by Landing CEO Jon Corner and the recently appointed head of programmes and partnerships, Maya Dibley. SKV will be tasked with developing and delivering The Landing’s PR for the next 12 months, which will include supporting its business engagement strategy, its events programme (including ERDF funded training and workshops), external partner liaison and B2B media relations. SKV will also be promoting The Landing’s new facilities, labs and workspaces, which have been developed to meet the needs of emerging sectors such as health, Virtual Reality, UX and the Internet of Things. 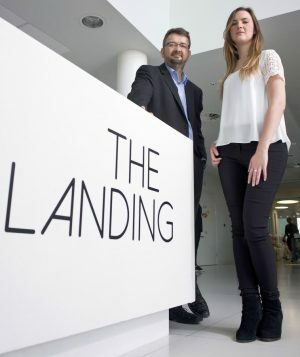 Maya Dibley, The Landing’s head of programmes and partnerships, said: “Over the last two years SKV has helped build The Landing’s reputation as one of the UK’s leading digital enterprise hubs and home to a wide range of innovative, hi-tech companies and start-ups. SKV director of strategy, Richard Bond, said: “Since first being appointed in 2014 The Landing is a client that we’ve really enjoyed working with as there’s always been so much creativity and energy generated by the businesses based there, and through its dynamic programme of events. In addition to The Landing, SKV’s handles a number of national tech accounts including Wakelet, Manchester Tech Trust and FutureEverything.